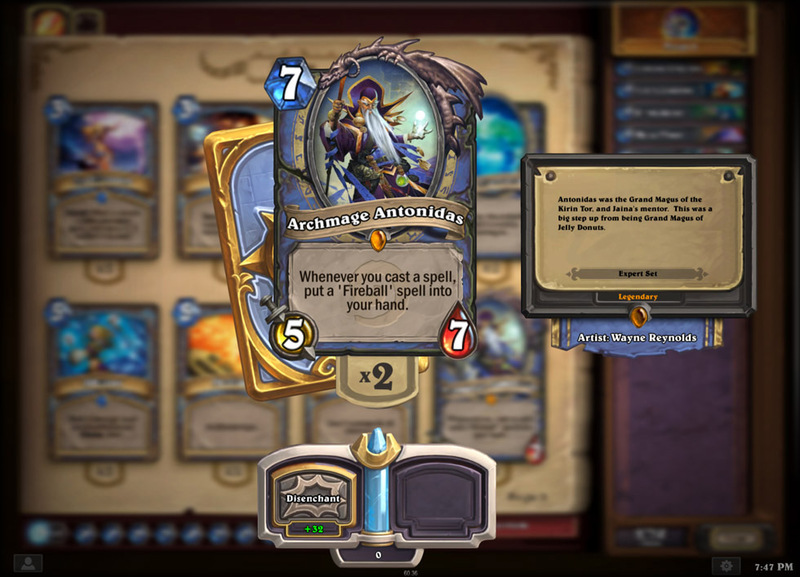 Hearthstone: Heroes of Warcraft Preview – Now is the time to play. 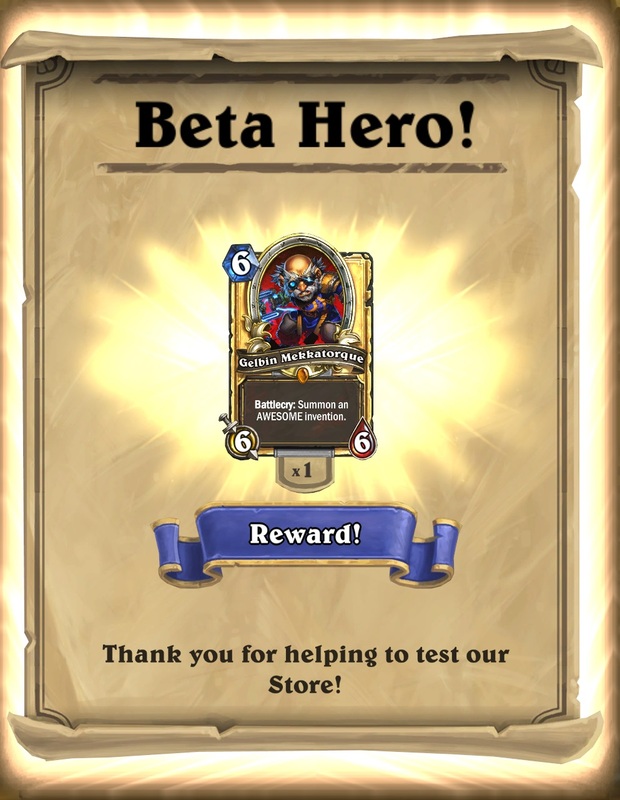 I waited and waited for an invitation to participate in the Hearthstone: Heroes of Warcraft beta, and when it finally arrived towards the end of October, I did what anyone would do! I proceeded to not play it. Well, not much anyway. I played a few games and I learned the basics, but I avoided allowing myself to become too invested due to the threat of card wipes forcing me to start over from the beginning. Such is the nature of many Beta tests. I knew immediately that Hearthstone was a great game and that I was going to get really into it someday, but I could wait. My backlog of games was beckoning. But now, months later, the threat of card wipes has passed! The Beta has opened up and everyone is invited! And so I started to play Hearthstone again, and now that I’ve given it my full attention, I am helplessly addicted. It must have been quite a surprise for Blizzard when Hearthstone was the game everyone talked about at BlizzCon 2013. After all, on paper, it is their least impressive game. It’s a mere spinoff of a greater franchise and was developed by a small team. And yet, the proof is in the pudding, as they say. Hearthstone: Heroes of Warcraft is a hit, and it isn’t even out of Beta yet. Now that I’ve played over 20 hours of it, I can see why. The game is incredibly fun! Fast paced, easy to learn, difficult to master and so addicting that I’m losing sleep, Hearthstone is an excellent collectible card game (CCG), and from the looks of things, we’re going to be playing it for a long time. Granted, the game naturally appeals to me as a fan of games like Magic: The Gathering, though Hearthstone only borrows lightly from the giant of trading card games (TCG). You don’t have to worry about resource management as it is mostly automated, you can choose your targets in battle (as opposed to your opponent choosing defenders), and most importantly, the game is easier as a whole, with far fewer complicated mechanics and rules. In fact, I would argue that Hearthstone is the perfect entry point to interest a player that has never played a TCG or CCG before. It’s so easy to pick up and play, and the games are so short (typically 10-15 minutes), that truly anyone can play it! Resource management is as simple as counting to ten. Each turn you get a crystal which can be used to play cards, and which refills every turn. So on the first turn, you can use a card that costs one crystal, on the second you will have two crystals, and so on. 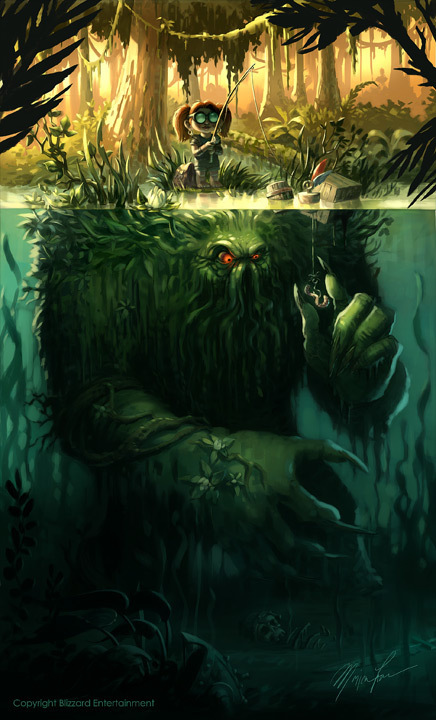 There is no need to play land cards or to tap cards for mana like in Magic: The Gathering, or anything of that nature. Both players simply get one crystal per round, and can linearly play stronger cards or more cards per turn as the game progresses. The objective of the game is to reduce your opponent’s health from 30 to 0 which can be done by summoning minions to do battle with or by casting spells. For example, a player might summon a Murloc minion on his or her first turn because on the top left of the card the number 1 appears, indicating it costs 1 crystal to summon. 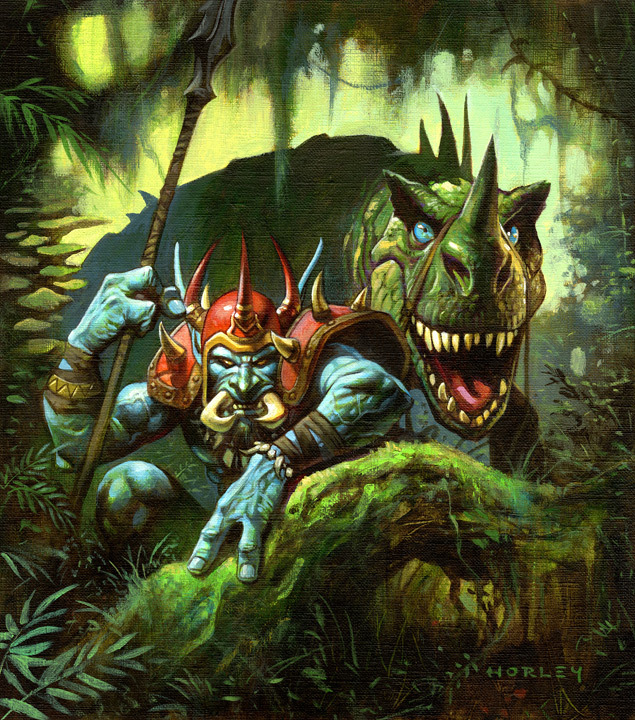 Like in most similar games, the Murloc cannot attack the turn it comes into play (unless it has the Charge ability), but on the next turn, the player can command the Murloc to attack the opposing player (or an opposing Murloc for that matter), and will deal damage according to the Murloc’s attack number which appears on the bottom left of its card. The Murloc also has its own health which appears on the bottom right of the card, so you know how much damage it can take before it dies, and if it attacks a minion, that minion will deal its attack number in damage to your Murloc as well. The Argent Squire can be summoned for 1 crystal (top left). It has 1 attack power (bottom left) and 1 health (bottom right). The opposing player might become quite fed up with your pesky Murloc minion and cast a spell to deal a couple points of damage to it. There’s nothing you can do to stop your opponent from doing this because in Hearthstone, only the active player can play cards. There are no interrupting or instantaneous effects to speak of, which is another important reason that the game is so accessible to newcomers. Eventually, as players summon more minions and cast more spells, one player will run out of health and the game will end. It really is that simple to learn and play. Of course, if the game was too easy, no one would want to play it. 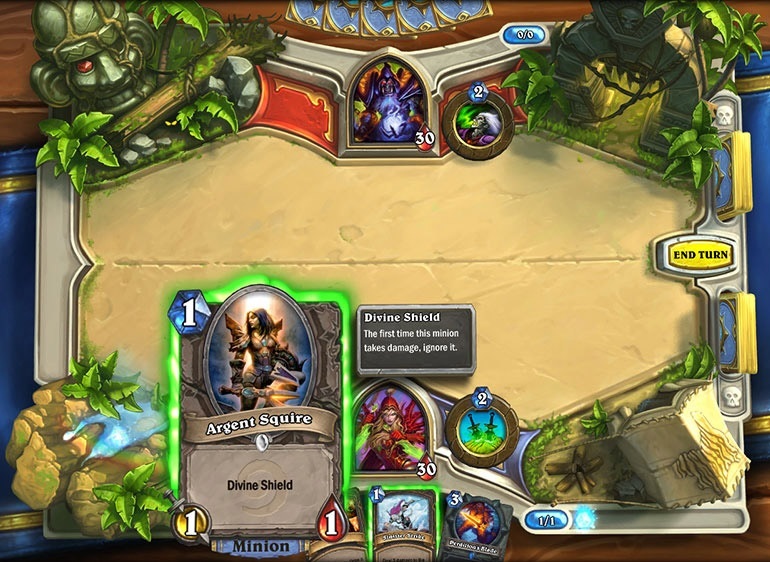 Fortunately, Hearthstone has surprising depth for a game that seems so simple on the surface. In addition to the previously mentioned Charge ability, minions can have any of several other abilities. Taunt forces opposing minions to attack the minion with taunt before they can attack anything else; Windfury allows a minion to attack twice per turn; a minion with Stealth can’t be targeted until after it has attacked at least once; and Divine Shield allows a minion to be attacked once without taking damage. Those are really only the tip of the iceberg, but Hearthstone makes it easy to understand all of these and other abilities, because mousing over a card will reveal a tooltip that describes what any of the relevant abilities do. There are also triggered effects which occur under specific circumstances. For example, a minion might deal a point of damage to a target as it comes into play thanks to a Battlecry effect, or a minion might deal damage as it dies due to a Deathrattle effect. Between minion abilities and triggered effects, Hearthstone has a wide variety of interesting mechanics. Certain cards and abilities will allow the hero to pick up a weapon, in which case the hero can attack a minion or the opponent just as though he or she were a minion. This can be risky business, because if the hero attacks a minion, that minion will deal its damage to the hero, but in many cases, this still works out in the hero’s favor in the long run. Weapons add even more strategy to the game. 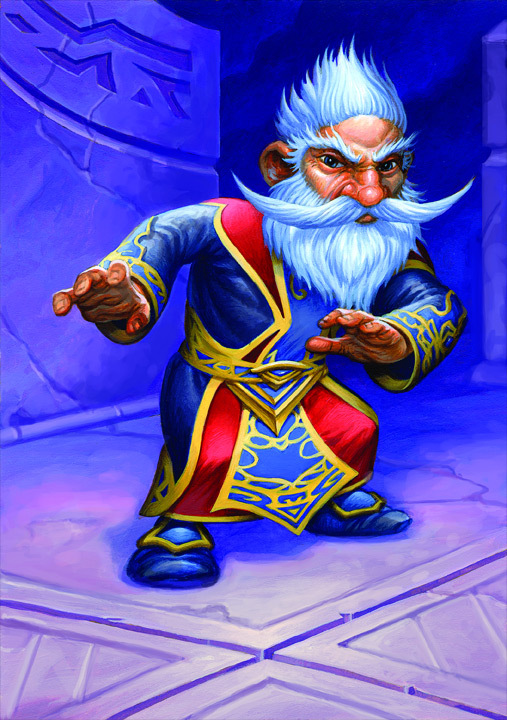 Other cards can set traps called Secrets, which are the closest thing to an instant or interrupting spell in the game. Once a trap is set, the opposing player does not know what will trigger the trap, only that a trap has been placed. For example, a card called Explosive Trap says, “Secret: When your hero is attacked, deal 2 damage to all enemies.” It’s a great card for turning the tide against a large army of small minions. But the real depth of the game comes down to the individual decisions made by the players throughout the game itself. As you play more and more, you learn not to play all of your cards at once or to sacrifice your minions unnecessarily. You start prioritizing cards that allow you to draw more cards and disregarding minions that don’t have enough health or have glaring weaknesses. You avoid the temptation of casting all of your buff spells on a single creature since it could potentially be destroyed by your opponent on the very next turn, wasting several of your cards at once. In general, you just start to play smarter the more you play, and in turn, the game becomes even more fun and addicting. 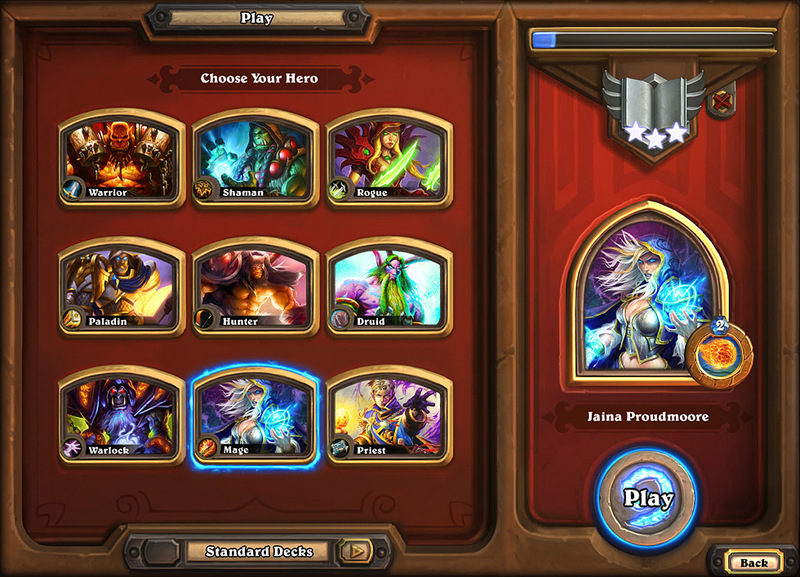 It also helps that there are 9 classes to choose from in Hearthstone: Heroes of Warcraft. Each class is represented by a hero from the Warcraft universe, and the chosen class determines which cards can be placed in a deck. 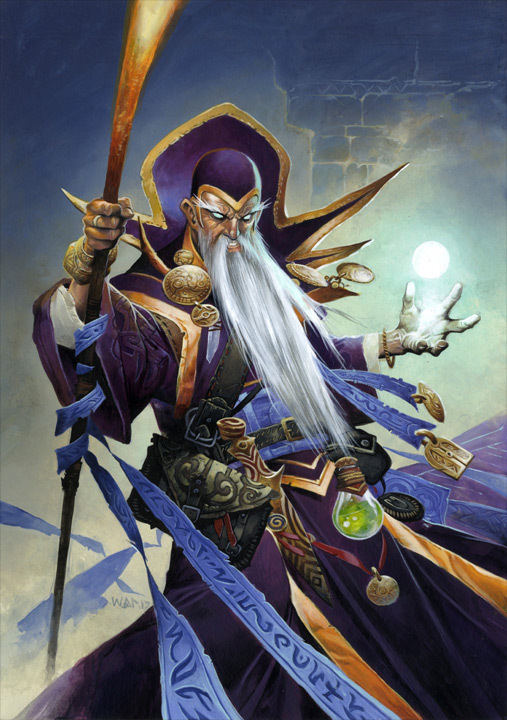 For example, only the Mage has Polymorph, a spell that can turn any creature into a weak little sheep, and only the Rogue has Sinister Strike, which immediately deals 3 points of damage to the opposing player. Each class also has a unique ability that can be used once a turn for 2 crystals. The mage can deal 1 point of damage to any target, the Hunter can deal 2 points of damage directly to the opposing player, and the Warlock can take 2 points of damage in order to draw a card. The Shaman’s ability is particularly interesting; it randomly summons one of a variety of totems, such as a powerless totem with 2 health and the Taunt ability, or one that can restore a point of health to all of the Shaman’s minions at the end of each turn. All 9 classes are fun to play, but where are the Death Knight and the Monk? Switching between the various classes is loads of fun as each provides a unique and interesting style of play. The Warrior is great for an aggressive style of play where big risks can win or lose a game. The Rogue is great at controlling the board, destroying opposing minions or returning them to their controller’s hand. And the Priest is perfect for the patient player and has tons of healing spells that can turn the tide. In addition to the class-specific cards, there is also a large library of neutral cards that can be utilized in decks belonging to any class. Finding the right combination of class-specific and neutral cards is essential to building a good deck. Like everything else in Hearthstone, building a deck is both incredibly easy for inexperienced players and rewarding and meaningful for advanced players. 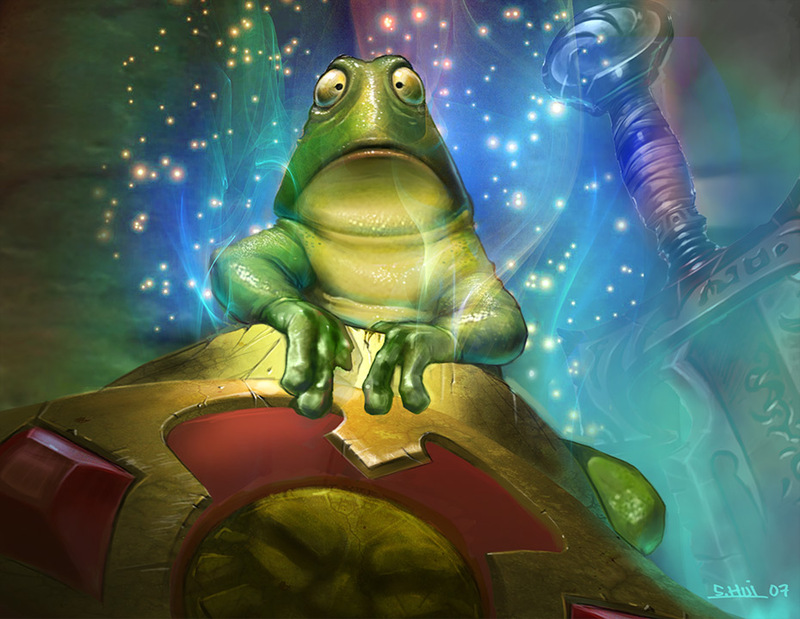 Newcomers can simply press the “Suggest a Card” button repeatedly in order to create a new deck, whereas dedicated players will carefully scrutinize every card, trying to find perfect combinations. Each deck consists of only 30 cards, so putting a deck together doesn’t take much time. After choosing a class, the game automatically hides all of the cards that belong to the other classes and sorts what is left according to casting cost. The interface also includes a handy chart that keeps track of how many cards of each casting cost have been placed in the deck. Referring to this allows players to balance their decks so that they don’t have too many low or high cost cards, which can weaken a deck in either situation. Blizzard has provided 9 slots to save decks into, exactly enough for one of each class, but I hope they add more at a later date, as I would like to have multiple decks belonging to each class. Instead, I end up making minor tweaks instead of entirely new decks as I acquire cards. 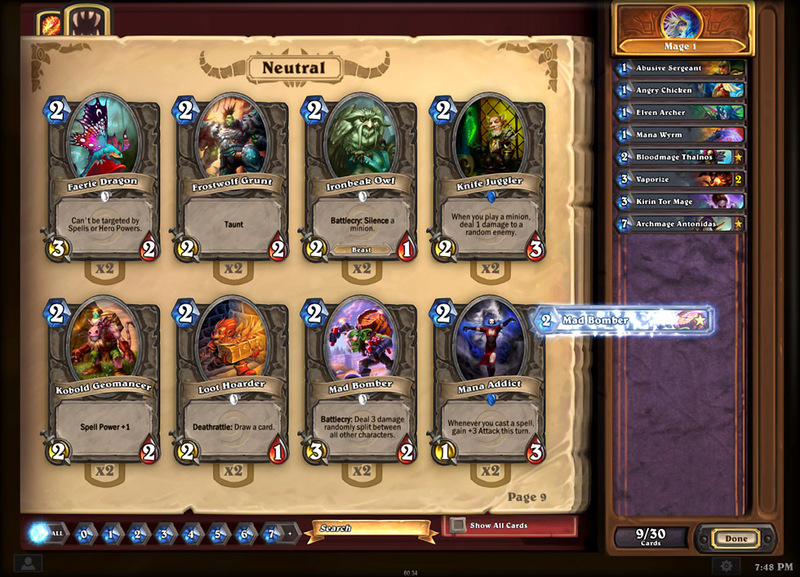 Making decks is easy in Hearthstone: Heroes of Warcraft. Though there is no way to trade cards in Hearthstone (hence why it is a Collectible Card Game and not a Trading Card Game), there are a variety of methods of acquiring cards, and most of them are free! Right off the bat the player is given a Basic Mage deck and a set of neutral cards, and is sent to Practice Mode. Here the player can choose a class to play against and try to defeat an A.I. controlled opponent in order to unlock that class permanently (including a pre-constructed Basic deck), along with some class specific cards. Win or lose, the class you are using will gain experience at the end of each game, and as the class levels up additional cards will be unlocked. By leveling up the 9 classes to level 10, the player will be provided with 2 copies of every single card in the Basic set. Many of these cards are actually quite good, and it’s safe to say that the game can be enjoyed even with only the Basic cards. Of course, it wouldn’t be much of a collectible card game if they just gave you every card. The Expert set is much harder to complete. Cards in the Expert set can only be earned by opening packs purchased with real money or in game currency, or by crafting them (more on that later). Each pack contains 5 cards, and at least one of those cards will be rare or better. If you are lucky, you will get more than one rare, or even an epic or legendary card. The rest of the cards will be common. The in game currency in Hearthstone is gold, and it can be earned by winning games online (10g for every 3 wins, up to 100g a day) or by completing daily quests (40g per daily). Between daily quests and rewards for winning, it’s not too difficult to earn enough gold for an Expert pack (100g) every single day. It is a bit time consuming to earn all of those wins, but if you enjoy the game, that won’t be an issue at all. For a free to play game, it’s great how much of the game can be enjoyed without spending a cent (all of it). There are also a few quests given to new players to help them learn the game and to provide them with some gold, so expect to open your first pack of Expert cards for free shortly after getting started. If you’re lucky, you might find a legendary card like this in your first pack. Eventually you are bound to acquire an Expert card you don’t want, or a card you already have two of. Since you can’t have more than two identical cards in a deck, having a third is quite useless. Cards that you don’t need can be disenchanted into dust, which can in turn be used to craft new cards. The higher the rarity of the card, the more dust you will get for disenchanting it, but as you might imagine, it costs a lot of dust to craft rare, epic and legendary cards. Still, it’s nice that every single card you get out of an Expert pack will serve some purpose. And it’s great that if you really need a specific card, there is a way to get it aside from buying a pack and praying. I should mention that there are special gold versions of every card in the game. Though functionally identical to regular cards, these golden cards look fantastic, and are brought to life with animated effects integrated into the artwork. The Basic set gold cards can be earned by continuing to level up the classes beyond level 10 (which will happen naturally as you play the game, whether against the A.I. or human opponents). The Expert set gold cards appear very rarely in packs. If you happen to disenchant a golden card, expect to get a lot of dust. If you are out of gold and you just have to open more packs, they can be purchased with real world currency; 2 packs for $2.99 ($1.50 each), 7 packs for $9.99, 15 packs for $19.99 or 40 packs for $49.99 ($1.25 each).Personally, I have not felt the need to spend real money, but I have definitely had the desire to, simply because the game is a lot of fun to play, and the least common cards are quite powerful and fun to acquire and play with. Whenever I play Hearthstone I am always thinking about opening the next pack. Fortunately, Blizzard is extremely straightforward about real money transactions. There are bright warning signs that say, “Warning: you are about to spend real money!” It’s just so refreshing to be playing a free to play game where it doesn’t feel like the developers are trying to trick you into spending money every chance they get. Hearthstone is a perfect example of “free to play” done right. When you are ready, you can start playing online against human opponents. Play Mode lets you choose between casual and ranked games. If you choose casual you will be matched against an opponent of similar skill and you can play for fun. You can still earn wins that count towards earning gold and complete quest objectives while playing casual. I really enjoy playing on casual because it is stress free and fun. But if you want to prove yourself, then you can take on the world in ranked games. You will be matched up against players of your rank, so the more you win, the harder it gets. There is currently no prize system in place for ranking up aside from an icon that represents how far up the ladder you’ve gone, but Blizzard has said there will be incentives added to ranked play at a later date. Outside of casual and ranked games in Play Mode and playing against friends, there is one other game mode included in Hearthstone, and it is by far my favorite mode in the game. It’s called Arena, and if you have played TCGs or CCGs before, you’ll recognize it for what it really is: sealed play. When you start a new game in Arena you will be given a choice from three randomly selected classes. After you choose one, you will then choose from three randomly selected cards and repeat that process 29 more times in order to create a deck. After that you will be matched up against an opponent in order to try your luck with your new construction. Your ultimate objective is to win 12 games before you lose 3—a tall order by any stretch of the imagination. If you lose 3 times, your Arena game is over, your deck is gone forever, and you will receive your prize according to the number of victories. Here is a deck in progress and being made up of randomly selected cards for use in Arena mode. Spend real money during the Beta to receive a golden legendary Gelbin Mekkatorque. When you enter the Arena for the first time you’ll be allowed to play for free, but subsequent games will cost either 150g or $1.99. But depending on how well you do, you could end up earning rewards that would cost quite a bit more than the entry fee. At the very least, even if you don’t get a single win, you will receive an Expert pack and 25-30 gold or dust, so even in the worst case scenario you will still come out okay without having lost much of your investment. But if you get at least 3 wins you will get back your entry fee and more, including a card. Winning 6 or more games adds the possibility of gold cards to the prize pool, and it just gets better and better the closer you are to 12 wins. Arena is highly competitive, because everyone is trying to get the most out of their entry fees, but the random nature of the deck design makes everything so much more interesting and fun. Arena even breaks some of the rules found in the rest of the game, as there are no limits to the number of identical cards that can be placed in a deck. Between the prize pools and the fierce competition, Arena mode is fun, challenging and rewarding, and an excellent complement to the other offerings throughout Hearthstone. And so I’m addicted; completely addicted. Hearthstone: Heroes of Warcraft sits proudly alongside its older siblings as a quality Blizzard product, despite its humble origins and small development team. The game is beautiful to look at, includes all of the usual charming voice acting we’ve grown accustomed to from Blizzard games, and most importantly, it’s a blast to play, both for newcomers and TCG/CCG veterans. Collecting expert cards is habit forming, but as habits go, at least this one is free—assuming you have the will power to patiently earn gold instead of buying packs with dollars. But even if you do end up spending real money, you will feel as though you got your money’s worth. Hearthstone never tries to trick or scam you, and instead will earn its income by enticing gamers with the quality of the product. It may still be in Beta, but the doors are open, and now is the perfect time to start playing. So pull up a chair by the hearth. 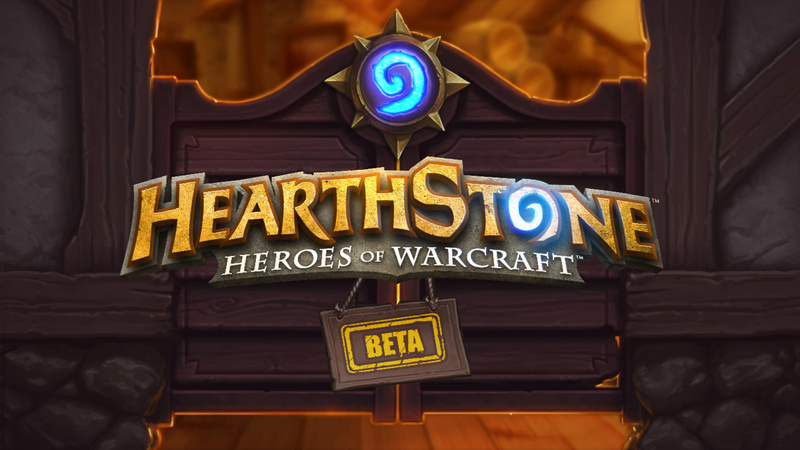 Ari played 23 hours of Hearthstone: Heroes of Warcraft Beta before writing this preview.